Ruth Valentine admires the subtlety of Jane Draycott’s poetic effects. 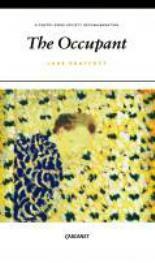 The cover illustration for Jane Draycott’s The Occupant is a detail from Vuillard’s La Porte Entr’ouverte. The palette of subtle yellows and blue-greens, the surprisingly strong mark-making, the hesitation of the figure peering in, and the title itself of the painting are all keys to this quiet collection. Jane Draycott seems to gaze at the world through a half-open door, noting unobtrusive detail and unexpected connections, as merged with her surroundings as the woman whose skin-tone so strangely matches the wallpaper behind her. so the tenderness of that painting, The Jewish Wedding, reflects back into the poet’s feeling for her city. all that we had loved. It was a start. As this suggests, Jane Draycott has a great facility with form and music, a formal range to match the range of material. Her lines stay in the mind for their quiet musicality. Occasionally this ease with form seems to lead her to foreclose too soon on the meaning, as in ‘Lost,’ her meditation on Hermione in the Winter’s Tale. Hermione’s sleep is a snowy winter, beautifully imagined, from which we know she will wake; but to these voices? The problem of understated verse is that understatement can shade easily into mundanity. ‘Italy to Lord,’ the first poem in the collection, uses the familiar trope of the encyclopaedia and its random connections, without quite animating it with any new perceptions. In ‘The Stare,’ the moon’s “platinum stare” (a lovely accuracy) is “just letting us know/it’s there. After all, life must go on.” Hard to imagine a poem, other than satire, that could usefully incorporate that last cliché. a girl could climb to her full height. checks its kill. You can make this happen. London Grip Poetry Review – Brant	The Hazards of Looking Back: re-reading E.F. Benson’s “Colin”, by Jane McChrystal.